MAC Shop MAC, Cook MAC Collection | Vanity and Everything in Between. I went to Rockwell yesterday for the lunching of Shop MAC, Cook MAC. Honestly, I haven't gone to MAC launches since Hello Kitty or Colour Craft (whichever was released later). I have come to realize that 80% of the time, splurging on limited edition makeup is 80% of the time a waste of money. You waste hours just to get the product you've been eyeing on only to find out it was sold out a few minutes before you reached the counter. Even if you find something a product that is one of a kind, chances are, you wouldn't use it as often as you would like to because you know that it's limited edition. There's like a 20/100 chance that MAC will re-release it on their next collection. So, I figured it's still best to invest on their permanent line. I'll post another entry about my review on those products above. I can't believe that there were a lot of people at MAC today. There was even once makeup class who was there for the launch. Amazing! So many ladies are into makeup now. I got to Rockwell at 2pm and I was given a number for the counter. My number was 18 and I waited for roughly an hour and a half before my number was called. 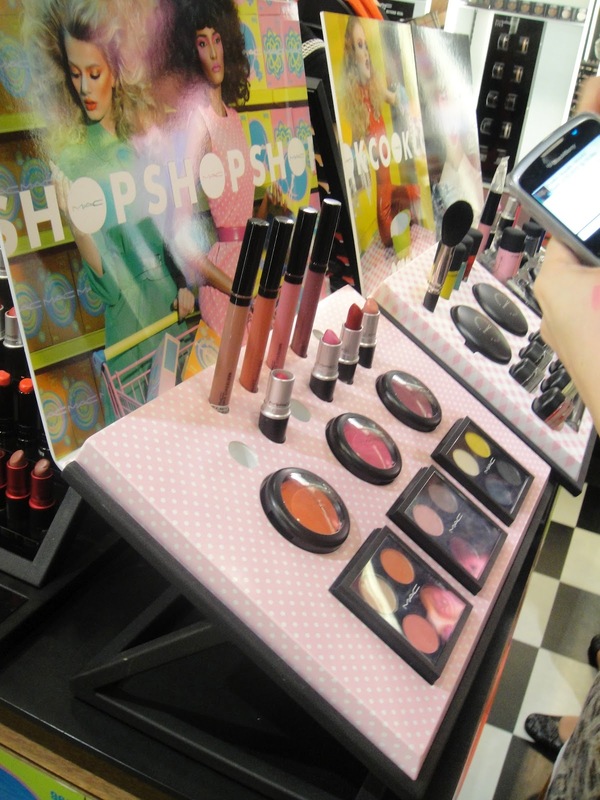 There was a short workshop and MAC store supervisor, Odessa, demonstrated how to use the products. She had a very pretty model, too! If you like this collection, I suggest you drop by any MAC store tomorrow. Watch Me Simmer is already sold out at MAC Rockwell because I got the last one, haha! I'm guessing Quick Sizzle and Naughty Saute are also sold out before this day ended because pink is the new red here in Manila. Dish It Up is another lipstick that I'm thinking of buying (although it reminds me of Most Popular from the Hello Kitty Collection). All the Kissable Lipcolours are nice, I swear! And so are the creme blend blush! As for the eye palettes, my favorite would have to be Shop and Drop. I just had to resist buying because I have a lot of palettes and I couldn't justify the need to buy a new one. The tender tones are nice to have, too. I couldn't decide what to get so I ended up not getting one! It was the same case with the fluidlines! But thinking about it now, I should have gotten all three! I hope it won't be sold out anytime soon so I can get my hands on it on the next payday! So, there you have it girls! If you bought something from this collection, let me know! I'd like to know your thoughts! I went to Glorietta's MAC and there were a lot of people as well. They are all after the new collection and I get to used some of their testers, indeed they are so pretty!! Me loving it, but the price a wee bit >_<.. I so agree with you :) but this collection is just too great to pass up!